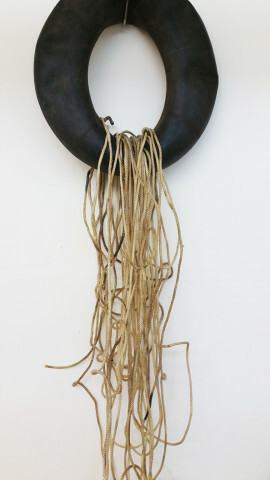 Dialogue: Detritus RAMUS | EVANS Collaboration 23rd June – 31st July Opening night Thursday 23rd June, 6-9pm Exhibition continues to 31st July, Tues to Fri 5-10pm, Sat/Sun 12-7pm. As current MFA students at Cardiff School of Art & Design, Natalie Ramus and Lisa Evans share a studio space on a daily basis where continuous dialogue occurs, discussing their work, interests and experiences. 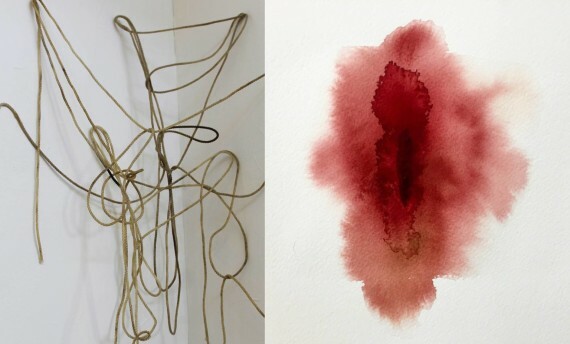 Their practices stem from different places; Lisa is interested in the exploration of form, confronting the boundaries of material and object manipulation whereas Natalie uses the materiality of the autonomous body to challenge the anxieties we have in relation to the abject body. When they first met there were distinct contras…ts in their approaches, Lisa coming from a background of sculptural installation and Natalie taking a much more conceptual and often performative approach. Despite the differences, when looking at their work alongside each other in the studio, they realised that both seemed to fit into the same conversation visually, with line, form and references to organic matter being visible in both. After noticing this they became interested in the notion of ‘subconscious collaboration’ and the bleeding of boundaries within a shared space. This exhibition at Spit & Sawdust is a chance to see the latest work both artists are producing with this relationship mind and in the lead up to their MA show later this year.